The Aspire Triton Tank is the innovative new sub-ohm tank from Aspire. It’s unique top fill design is a nice improvement over previous Aspire tank models, and it’s a large 3.5ml glass tank holds plenty of e-juice. It’s compatible with 0.3, 0.4 and 1.8 ohm heads, each made with Japanese organic cotton for the best flavor experience. 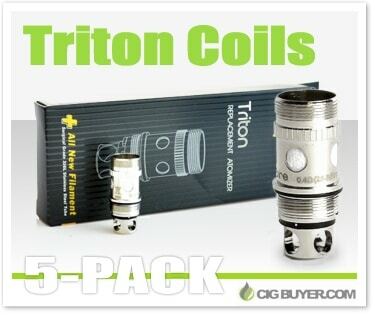 Triton coils are also compatible with the Aspire Atlantis V1 and V2.